I’ve been working on this piece for a while, trying to put together the different thoughts that have been buzzing in my brain for the last few years. Although I’m optimistic we can make a big dent in gymnastics injuries, unfortunately it is likely an inevitable part of gymnastics. 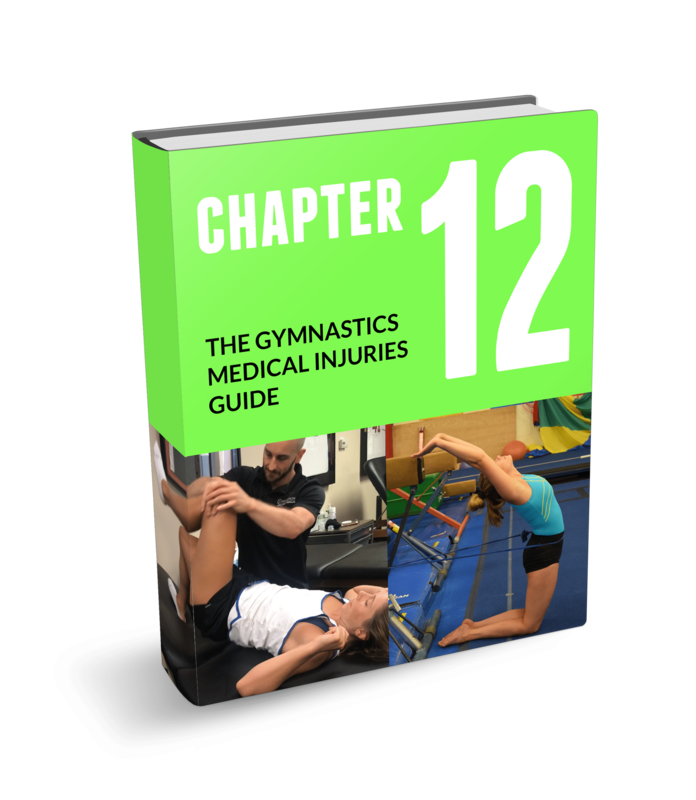 Following the healing of an injury and ideally formal rehabilitation (doesn’t always happen), a slow return to gymnastics training has to put into place for the gymnast based on their individual injury. We all have to remember that there is quite a jump from everyday activities to the high forces of gymnastics, and that the athlete may have been out for some time creating de-conditioning. The best hope is that the rehab specialist does as much as possible to prepare them for the demands of gymnastics. But all of gymnastics can’t be simulated in the clinic and some gymnasts don’t have formal rehab, which leaves a large gap in place to get back to full gymnastics training safely. Research supports that a big possible risk factor to ongoing overuse injuries or re-injuries in gymnastics is a premature return to sport. From personal experience over my years in gymnastics, and as many readers may agree, I think this is pretty accurate. I think many parents/coaches/gymnasts get concerned when this phase of the injury comes into play, especially if it was a more serious injury. I wanted to offer my spin on this idea from a pain science, adaptation, and psychological point of view. Here are 3 concepts for people to think about. One of the areas I have spent a lot learning about is pain science, and it completely changed my PT/coaching thought process. By no means am I an expert, but I’m learning more and gaining experience each day. In nutshell pain science literature looks into why we feel pain, how our different body systems are involved with pain, how it affects our movement, and more. Pain is an incredibly complex beast and has a huge influence on how we move, but here are some interesting points. In an over simplified way, pain is produced by our brain protectively in response to danger or perceived threat. With an injury and pain experience present, the brain may start to associate certain movements with a “danger signal” and create pain in the injured/”in danger” area as protection. In the example of a gymnast who has overloaded their lower back creating a stress fracture, the brain may neurologically link together “extending the spine” with “danger”, and produce intense back pain to protect the site of injury. The same can be said for a sprained ankle and jumping, or a painful shoulder movements overhead. In the short-term we certainly need this, as the brain is trying to protect the area and limit further damage. The gymnast avoids extending, may limp to protect their injured ankle, and so on. The brains threshold for pain/movement is lowered, which is why the smallest things (sitting in bad postures at school, stepping the wrong way on the ankle) may provoke pain for the gymnast. With rest and proper care the fractures/sprains/tissue damage will naturally heal. This should ideally come with the danger alarm sensitivity reducing, and the pain/movement thresholds being restored to normal. Sometimes it happens naturally, sometimes more services are needed to educate the gymnast through rehab. Hopefully through rehab the proper steps will be taken, and the gymnast will recover the ability to regain their extension motion/jumping pain-free. Following this and proper discharge testing, the gymnast should be cleared to return to training. Here’s where it all connects. Remember that despite this, a huge gap still exists between every day activities or rehab testing and the forces of gymnastics training. If the gymnast resumes aggressive gymnastics skills too quickly, it may start to trigger the “danger” signals to go off again associated with the body part/area. I have seen this first hand with gymnasts patients returning back to training following injuries. They may get over excited about being “cleared” and go against advice testing the waters on skills, only to be upset when they develop some pain. Chances are they haven’t re-fractured their back with a few tumbling passes. A possible alternate explanation is that the neurological linkage associating “extending” and “danger” , along with lowered pain/movement threshold, is triggering the danger alarm as a protection mechanism of pain. I touched on this concept in a post discussing a recent evaluation I had for a gymnast with an old stress fracture (find it by clicking here). Gymnastics skills must be slowly added back in with proper means in a non provoking manner, which is known as graded exposure. This way the brain can slowly be exposed to movement that is not threatening, and start to re-build movement and pain thresholds to activity. For the spine example progressing through proper basics, strength, and non-impact/extension activities first are usually all non threatening. Then when appropriate they can start with basic forms of spine impact/extension like more advanced basics/drills, extending drills over a barrel for assisted extension, Tumble Trak tumbling, light tumbling/extending, and so on. If the progression is done properly, we can slowly increase tolerance to activity in a non threatening way, and not stir up any trouble in the process. **DISCLAIMER**A very important point here is that I am by no means giving anyone the excuse to train through pain because it’s “all in your head”. Tissue adaptation and re-conditioning the body to handle gymnastics force is also crucial, which is my next point. Along with this, pain distorts motor control and can significantly change movement. The presence of pain will create compensatory, dysfunctional movement patterns the brain may utilize as the “go to” movement. The cascade following this and learning/using faulty movement patterns is enormous. 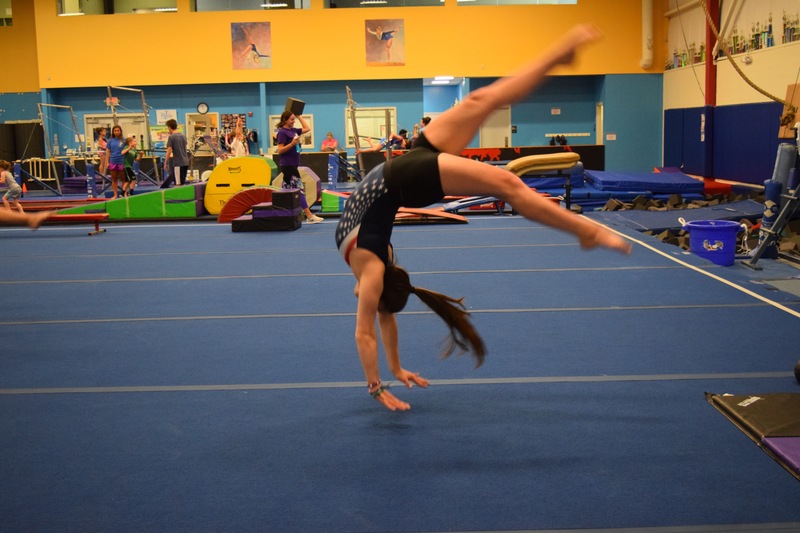 Selecting the progression back to sport must be a collaborative effort between gymnast, coach, and healthcare that ensures pain-free, quality movement is created. We have to respect a slow return back to gymnastics to not have pain and ensure proper movement, never trying to be tough and rush the process. Although I do follow the pain science methodology as noted above, I do think the concept of giving healed tissues the proper environment to be stressed and adapt applies. The same jump in activity that may trigger the danger alarm as noted above, also comes with the fact that gymnastics exposes the athlete to incredibly high forces. Further branching off the examples above, the ankle may have not been subject to the high force of tumbling (13 – 17x Body weight) for a few months . The spine may have not been subject to forces of extending/landing/swinging (dependent on skill, but still very high) in possibly 3-5 months . The body also has not been exposed to that volume of activity (possible 70 extensions/100 impacts in full practice and multiple days). Ideally with a progressive injury, proper steps have been taking to correct skill technique like proper landing form for ankle issues, or proper extending technique for back pain. However, some injuries are flukes or accidents. Regardless to this, when the time is right the gymnast actually needs proper exposure to regain their tolerance to training (both pain science above and tissue tolerance). We have to create an environment where the gymnasts’ system and tissues are properly stressed and recovered, in an effort to promote adaptations. This again is a form of graded exposure, and finding the right balance is tricky. We have to be aware of this, and make sure the choices we make as coaches/gymnasts is to monitor the amount of load that goes through previously injured tissues. If the gymnast jumps back in to everything quickly, it may create an overload to the tissues that may have not yet built up tolerance to such high stress. Also, if the gymnast is not given adequate recovery after they do start getting back to gymnastics, it may create a snowball type effect for overload because tissue stress is greater than tissue recovery. The gymnast should also be continuing on a maintenance home program for pre-hab to combat re-injury risk, as one of the biggest predictors of injury in research is a previous injury. There will most likely be some soreness expected and rust in the gears. However, a gymnast understanding the difference between soreness that is temporary and similar pain that may be lingering is very, very important. That concept holds true for all gymnastics, not just returning to sport. The last point I wanted to make actually has links to both pain science and creating an environment for proper adaptation. Especially with larger injuries, the return back to gymnastics can be very anxiety provoking and psychologically challenging. In the last year being part of the return to sport progression for some bigger injuries from a dual coaching/PT standpoint, I can tell you this is a very real aspect to coaching. From a pain science point of view, it’s actually fascinating that memories, emotional state, and fear all may have a huge influence on the pain experience. Research has suggested that due to pain being a very complex interaction of multiple areas in the brain, aspects such as memory of injury, emotions, and fear can heighten the perception of threat and elevate the “danger” signals. There is a lot more to it than this, but coaches/parents/healthcare all have to make sure this area is handled appropriately. The last thing we want is someone being forced back into gymnastics aggressively, only to create a situation where fear takes over. Problems can range from creating mental blocks, influencing anxiety/frustration, or worse have effects on mental focus predisposing another injury. Many coaches already have this down to an art form, but I just wanted to mention it because it’s so important. There will definitely be bumps in the road and some sticking points, but in the end being accommodative will pay off. The return to sport process is easier for some injures more than others, and I can tell you I’m still working quite a bit to find the best way to go about it. The hope is that the gap between rehab and performance is minimal, but that doesn’t always happen. Take it from me and learn from my mistakes, rushing the process will not help anyone and is risky for the gymnast. It should be progressed based on logical science, and the gymnasts pain/comfort levels. Although many times my gymnasts/patients may get frustrated with me for holding them back or putting limits when they feel ready, in the end I feel it’s for the best. I tell them you have to “see the forest behind the trees”. I am a former gymnast and know how bending this principle comes around with important competitions, I’ve done it myself. However, I didn’t want to dive down that rabbit hole and I think this cases are far less for the majority of gymnasts. For the majority of cases, I feel proper return to sport allows for a platform of full performance return, reduced re-injury risk, and also the chance to correct the possible factors that may have caused the issue in the first place. Buttler DS., Mossely L. Explain Pain. Noigroup Publications, 2003. Great post Dave! I’m just coming back from my most serious injury to-date after a tumble off beam 7 weeks ago. Despite having the background I do in movement coaching, and knowing what to do re: pain science & recovery, it still stunned me when I found myself running fearful thought patterns when my ankle would be stretched into the injury position during my rehab. I knew it needed to be done and if I went super slowly, I could see it didn’t actually hurt but if I was moving faster through the rehab or someone else was moving my foot for me, I would get tense, nervous, clammy hands, all of the fear signs! I took a solid 7 weeks rehabbing and gradually loading my body up again and just this wknd came back to actual gymnastics practice. The motto of my coach and I is “leave an ounce in reserve” since mentally I’d probably still feel mentally good(especially if practice was going well) despite my soft tissue starting to fatigue out, a good amt left in the tank beats one ounce too much effort when returning from injury. Thanks again. Love your stuff! Great post Dave. As a physical therapist and former gymnast, I couldn’t agree more with the importance of a gradual, gym-based return to gymnastics program implementation. However, I often find this difficult to convey to my athletes, parents, and coaches who would love their athlete to return to gymnastics fully ASAP. I find that even if I provide them with a basic skill progression plan, they tend to return to gymnastics more quickly than intended. Do you have any protocols or recommendations for a step-based gym based progression to provide the coaches with? Thanks Kat! Glad you like it and I appreciate you taking the time to read. Unfortunately I think a lot of ongoing and recurring injuries stem from being rushed back into practice without correcting the skills or dysfunctional movement patterns that may have contributed to the injury in the first place. If was an accidental trauma then that’s a little bit of a different story, but still they need time to recalibrate their system to the high level of force and activity gymnastics creates. Definitely the biggest tool I think we have is education, talking about these concepts and how a few extra weeks may be worth months and entire seasons with a risk of re-injury. I have seen too many cases where unfortunately the gymnast rushed back in and then has set back just as they were doing so well. Every injury is different but, I’m starting to become much more of a fan of closely monitoring volume/exposure and trying to increase by a certain percentage per week. So for an ankle returning back from a poor landing form and overuse situation, drilling in good double leg and single leg jumping/landing technique. Then, I would try to first start on softer surfaces and monitor the number of impact landings they take between each event ot control the volume overload. Week by week if things are all going good you can increase the percentage as well as the landings to more realistic surfaces, making sure quality is never lost. Sometimes the return to sport process can be a golden window to really drive home the correction of movement that will save more problems down the road. Every injury is really different and I have some thoughts around what/when to add things, so if there is something more specific in your mind just let me know and I’ll try to help out. Thanks for commenting, and have a great weekend! Are Gymnasts Being Limited By Strength & Conditioning That Isn’t... How Much Flexibility Is Too Much For A Gymnast?